I will always have a special affinity for Victor John Angelo Raschi, even though I never saw him throw a pitch in a single big league game. That’s because he started his professional and Yankee career in my home town of Amsterdam, NY, pitching for the Amsterdam Rugmakers in 1941. At the time, the Rugmakers were New York’s minor league affiliate in the old Canadian American League. Notice that year, 1941 again. 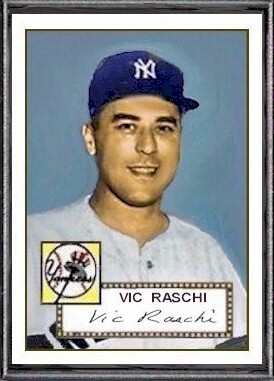 Raschi was born on March 28, 1919 in West Springfield, MA. That was not a particularly good time to be born if you turned out to be an aspiring big league baseball player. Why? Because just as you reached the age at which most professional baseball careers began, your country got involved in WWII and you were called to serve. So after going 10-6 for the Rugmakers that first season and becoming a legend in my home town, Raschi got to spend just one more season in the Yankee farm system before joining the air force for the next three years. By the time he returned, in 1946, the Springfield, Massachusetts native was already 27-years-old and by the time he became a starter for New York he was 29. For a half-dozen seasons from 1948 to 1954, this fire-baller was as good as any pitcher in baseball. Raschi was a three-time twenty-game winner for the Yankees, compiling a .706 winning percentage and a 120-50 record during his nine years in pinstripes. He combined with Allie Reynolds and Eddie Lopat to give New York one of the top trio of starters to ever pitch in the same Yankee rotation and that rotation led them to five straight World Series victories from 1949 to 1953. Raschi shares his March 28th birthday with this former Yankee reliever and this one too.